I have seen photos recently of people snapping pictures of their pantries and asking what they can use to create meals that will last and help stretch their budget. The truth is, our family has a few items that we consistently purchase in order to make healthy meals while still remaining frugal and sticking to our budget. I compiled a short list of the 5 foods my family buys in order to make meals that last without breaking our budget and I want to share them with you as well as some different recipe ideas to go along with it. 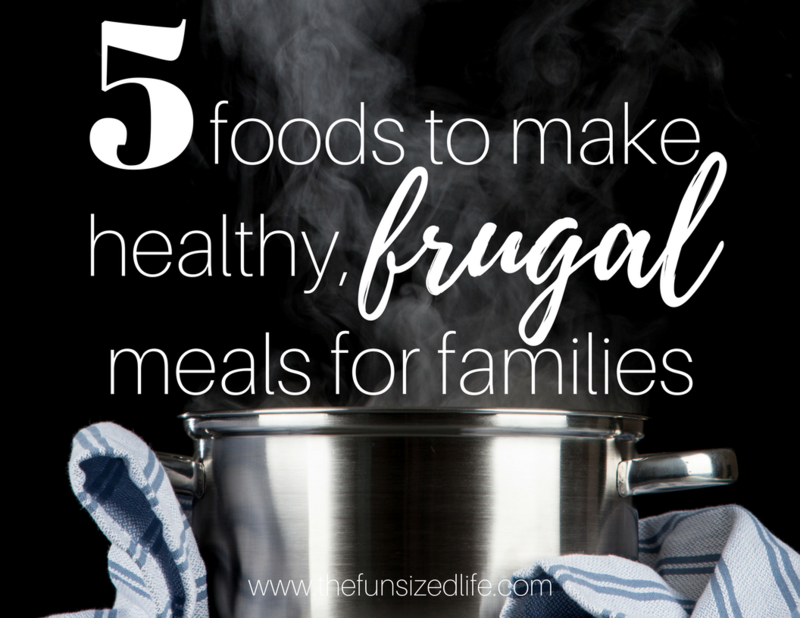 So here are my top 5 foods to make healthy, frugal meals for families. Not only are oats very filling and good source of fiber, they also go a really long way when it comes to creating meals that are easy to store and freeze. They are something that you can easily find gluten free as well if you are not someone who can process gluten. My personal favorite brands for gluten free oats are Trader Joe’s and Bob’s Red Mill. Both are inexpensive and one bag can easily create a week or more worth of breakfast foods. I talked about this a little in my post: $10 Breakfast Meal Prep for Family of 5. Meal prepping is huge when it comes to making your food last, there are great programs like $5 Meal Plan that make shopping on a budget extra easy by taking all the planning out of it. If you have a busy schedule and don’t have a lot of time o gather recipes and get ideas together, I highly recommend checking out the $5 Meal Plan. For those of you that want some extra ideas because you are stuck in a meal prep rut, I have some great recipes below and throughout the post to help you make the most of your food! Rice goes an extremely long way when it comes to planning out frugal meals that last. Not only is it a staple food of some of the healthiest nations, like Japan. Read my post on the Japanese and why they never retire. Rice is also great for digestion, keeps you full and has a kind of super power when it comes to making meals last way longer. When I was growing up one meal we had frequently that didn’t take a lot of prep work and effort for my mom to make was rice with tuna…and seaweed. Yup, I was the kid in the neighborhood who always had seaweed in the kitchen. Now, I’m not saying you have to take this same route. You could easily chop up some leftover chicken, beef, pork or whatever else you have on hand. The same goes for beans and lentils. Another new favorite way I have been using rice is to make patties. Basically it “beefs up” what would normally be a bean or chicken patty, gives me a little more food to store and adds in the grains for the meal as well. You can see this recipe as well as some more in my post: 5 Frugal Family Meals to Make with One Turkey. You could also skip the extras all together and just make my Vegan Wild Rice Burgers. For the 2 years I ate a vegetarian/vegan diet, I was really able to learn to work with cooking veggies and working with beans. It was such an awesome experience. Read how veganism taught me minimalism and ultimately helped me get to the plate I’m at today. The best thing about using more beans and lentils is the insane amount of money you spend when compared to meat. I even discussed the price difference from dry beans to canned beans in my post, How Our Family of 5 Eats Healthy for $100 a Week. Depending on where you purchase the, you can easily get a full bag of dry beans for under $2. These are another great alternative when it comes to finding something to go along with your rice. Taking the time to season your beans can add a world of flavor to a simple rice bowl. My personal favorite way for using lentils is in place of taco meat. By using my regular seasoning I have been able to create lentil tacos that have perfect flavor and last a great deal longer than using meat so leftovers last forever. And maybe we’re crazy, but my kids never complain about having tacos multiple days out of the week.
. See my full review of NutriBullet here.) Roll your mixture up into balls and head out the door. I have several quick make, raw date recipes like this that you can check out and get creative with. There are more where these came from in my Easy Peasy Dessert Cook Book. While raw date treats are faster to make they can also be used to help sweeten up some of your favorite baked goodies. I am a big believer in using every single pice of your food if you’re possible. I go over this a little in What to do With Pineapple Peel and How to Start a Compost. That’s why I save scraps of veggies as well as any chicken or turkey bones. If you buy a chicken or turkey and have leftover bones you can easily make stock by putting the scraps in your crock pot along with water. The same can be done with your vegetable scraps. The best ones for a veggie broth are celery, carrot, onion, and garlic although you can definitely get creative with your veggie broths. After creating your own homemade broths effortlessly, you can stretch the remainder of your groceries by creating soups, stews, chili, gravy…you name it. Get creative. Ultimately, the best way to be wise with your groceries is to make a great plan and stick to it. Make use of what you have already got in the your pantry so that you are sure not to let anything go to waste.